You may have already been warned about the dreaded "Fresher's Flu", but what is it exactly? Well first of all, it's not the actual flu! During freshers, the majority of new students will be partying a lot, which means a combination of a lot of alcohol and not a lot of sleep. Adding on to that, you probably won't be living that healthy lifestyle of regular exercise and nutritious eating yet. Thirdly, you'll be living in a big student hall in close proximity to a lot of other people. These are all factors that will make you more prone to a lowered immune system, feeling weak and getting ill. Even if you personally try your best to stay healthy, you're also going to be in lecture rooms with a lot of students who probably will feel ill at some point. Even lecturers get freshers flu from being in a room full of freshers! Eating lots of food that's good for you - vegetables and fruit! A much more serious illness that incoming university students are at risk of, is meningitis. Meningitis is an infection of the meninges (membranes) of the central nervous system (brain and spinal cord). Teenagers and young adults have increased risks, along with living in boarding schools or for example, university halls, increases your risks. Fortunately, all incoming university students are eligible for the Meningitis ACWY vaccine with the NHS! Best thing you can do is to go to the GP and get your vaccine. 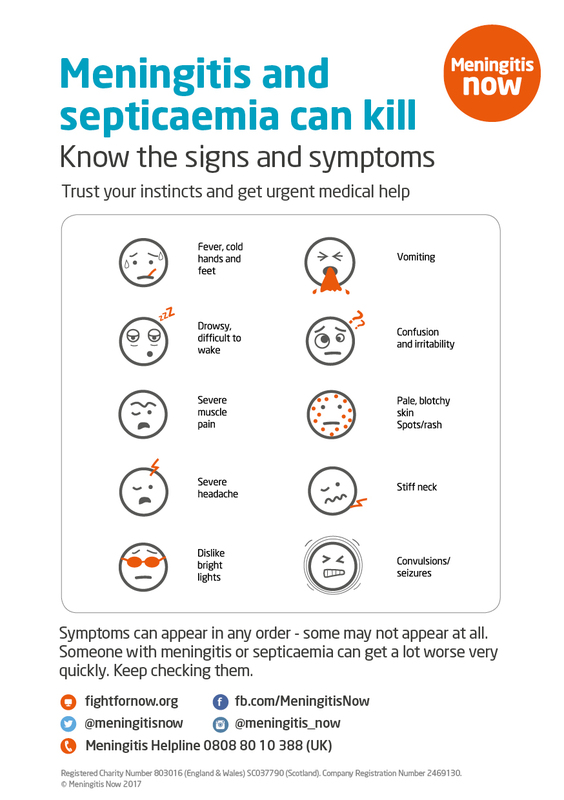 It's also good to be aware of the main symptoms, so check out the poster below. If you or someone you know starts experiencing these symptoms, get emergency medical care ASAP. It is a very quick and fatal illness.